We all are well aware of the fact that the Internet is inundated with websites and blogs that claim to be the best source for news. It’s overwhelming, right? Many of us, from music listeners to producers, have a few go-to spots that we rely on to follow music news, industry updates, learn how to make music with production tips – a favorite blog, a Feedly feed, etc. Others rely on social media for news. Whether the spots are strictly about EDM or focused in the broader music industry as a whole, there are numerous options, and we all have our favorites. But do you feel like those spots are getting old? Are they not providing the information you want or need to know? Well, don’t worry – we’re here to help. 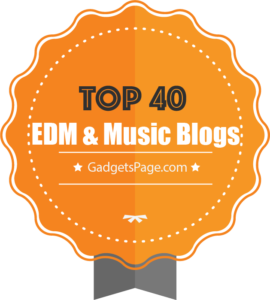 Today we’ll address the question: what are the top EDM and music blogs to follow? Your EDM covers the latest and greatest in electronic music, both on the news front news and in new music. You can expect breaking news from the EDM world, coverage of new tracks from a solid mixture of well-known artists and up-and-coming shining stars, op-eds on industry happenings and more. Their social media platforms are also great to keep your Facebook, and Twitter filled with links to the latest news, fun videos and memes. EDM.com is quite the bible in terms of a go-to music blog – it has just about everything you could need. Not only does it keep up with the latest electronic music industry news – but it also has a heavy focus on the music side and audience engagement. They also have one of the most simple, best ways to discover a new track regularly: they offer a spotlight track at the top of their homepage that allows you to stream it and follow the artist on social media platforms. Dancing Astronaut is a favorite in the electronic music blog world, as it has an ideal balance of news and musical coverage. Their articles are often more long-form, which is great for the reader who wants to learn more about details about particular news or festivals. You can truly expect high-quality writing and interesting, fun facts when reading the site. Their #astropics section also features a fun photostream of shots from shows, festivals and more. EDMTunes is a great resource for news, music, videos and live event reviews. They regularly break some of the biggest industry happenings particularly in relation to music festivals. Their music section is constantly updated with new bangers and is known for highlighting new artists that haven’t quite broken through to the scene yet. Their Viral Tracks tab on their homepage is also an easy way to find some current favorites to groove to. Magnetic Magazine brings their take on culture coverage to the electronic music blog scene and does it extremely well. Their site is one of the best references for good long-read articles that cover everything from what to bring to a festival to clothing brands making a difference in the industry and the gear every DJ needs for their performances. Beyond the normal news and music coverage, Magnetic Magazine is one of the top spots for education and opinion pieces. EDM Sauce puts a fun twist on the regular electronic music blog by putting a heavy focus on featured playlists and popular artists. Though they cover news regularly and often are one of the first sites to cover huge news, they definitely have mastered the art of music coverage. They offer numerous new routes to music discovery, including trending songs, free downloads and a new music section filled with new artists, just to name a few. This Song Slaps is similar to EDM Sauce in the sense that it has a heavier focus on music over news, with a particular favor towards trap music (which, all in all, makes sense with the site’s name). You can find coverage on new tunes from a mixture of famous and not-so-famous artists, from remixes to originals, EPs and more. If you’re on a hunt for new tunes, it’s easy to search by genre as well – it’s like a giant library of tracks waiting to be explored. We Rave You tends to focus on – you guessed it – the more “rave” side of the electronic music industry, and they do it well. Their editorial section also dives into some of the bigger news happening in the industry with coverage on many track birthdays, weekly selections of the best releases from big artists and celebrations of track birthdays that remember the artists’ history and the mark they’ve made on the world. Run The Trap makes digging for the latest news simple and fun. They always post a single featured article on their front page that highlights the important news for the day, keeping you in the loop if anyone happens to ask you what’s been up with the industry lately. They also offer a Run The Trap-curated Spotify playlist that’s perfect for background music while you’re scrolling through the site. With tons of artist premieres, free downloads and features on new bangers, Run The Trap is a music blog you’ll want to remember. Daily Beat has mastered the art of intertwining all of the big subjects in the industry: news, music, festival and event reviews, interviews and more. With a simple front page feed, you’re never overwhelmed with what’s happening – instead, it’s a perfectly curated feed that gives you a little bit of everything. Their Lifestyle section also offers deep dives into topics in the industry like reducing your carbon footprint at a festival, how to participate in upcoming festival themes and ticket giveaways for local shows. This Song Is Sick has been around for years and built a reputation as one of the best spots to find new music you may have never heard before. Resident Advisor has been looked to as a staple in the electronic music blog world for many years and has built a repertoire as one of the best references for tour dates and news about the international electronic music industry. It covers all the bases from across the globe – venues, shows, festivals, artists and more. Billboard has also been a long-time staple in the music blog world, but unlike other blogs on this list it moves beyond electronic music and expands into numerous other genres: pop, hip-hop, rap and more. You can find topics like artist interviews, insights into new releases and tours and breaking news here. Less Than 3 covers all the bases: from artist interviews and contests to the ultimate artist-curated playlists and libraries of music by genre, this is a reliable source for those passionate about music that are looking for new tunes. The DJ List not only allows you to find your favorite DJ – or discover a new one – with a simple search bar; it also offers an in-depth news section that covers many artists you may never have heard of before. MixMag sits in a similar bucket as Resident Advisor and Billboard as one of the most well-known names in the music blog world that is looked to globally for news and music. They not only hit the music, news and events happening in the industry but also dive into the tech and fashion in the space as well. It’s an absolutely worth-digging site you’ll lose yourself in for hours. DJ Mag is a haven for electronic music lovers – another bible to add to our list. They’re known for their ‘Top 100’ DJ list. Everything you could possibly want to know about the industry can probably be found here, and they feature news that happens around the globe with in-depth coverage and captivating writing. Ableton Live’s Blog is an obvious pick! It keeps you up to date on anything and everything related to Ableton, as well as interviews and videos made by the site. The name might give this guy away: it’s all about DJ tech and Tools. If you need reviews on gear or advice on performance techniques, give this blog a read. EDMProd gives you a guide on how to produce music and useful advices on thriving in the music industry. It also offers a blog on production tips and tricks. Point Blank is another great spot for info on Ableton Live. It’s an Ableton Live School and features a variety of videos that can teach you about music production. Don’t come here with a few minutes to spare, though – the videos are longer in length and ready for you to dive in. Splice is not primarily a blog – it’s actually a sharing service – but their blog is filled with insanely helpful artist interviews filled with techniques you can build into your own production. This blog, like Splice, is also not primarily a blog – but they have a killer blog. Dubspot is a production school based in Los Angeles and New York, and their blog regularly offers tutorials and videos that are perfect for intermediate producers looking to learn. The Music and Audio blog from CreativeLive is a gem. With a high-level focus on music production, it offers a number of resources, interviews and ideas for producers in all genres. CDM is an eclectic blog that focuses on the stories about, gear behind and artists within the world of music production. As one of the largest music production blogs in the industry, you can expect new, high-quality content regularly. Output’s blog not only highlights artists and the production basics but also covers fun subjects like staff favorites for production gear and Q+As with producers from all kinds of genres. Music Radar’s coverage spans across just about every subject in the music space: interviews, gear, tips, techniques, production ideas from makers like bands and DJs and more. Mix Online is in the same boat as Music Radar, though they also have a strong spot in product reviews. If you need new gear and an unbiased, in depth-opinion on it, give this site a look. The experts are in. Hit Audio Tuts for that expert advice you need about production from start to finish, including recording, post-producing and all of the surrounding areas. If this isn’t self-explanatory, we don’t know what is. Get the ultimate how-to lowdown on electronic music production here. We love the phrase “think tank” particularly because it embodies exactly what any of us could dream of: a wealth of knowledge all brought into one “tank” – the blog. Music Think Tank is a wealth of knowledge from key thinkers in the online music business and a must-read. Yep, you got it: a site about production gear and software for sound. Sounds and Gear features reviews and news, tutorials and demos, libraries of instruments and sample kids, plug-ins, apps… the list is endless. Utilize it. Ah, Reddit – a wealth of knowledge (and trolls) built from the community. EDMproduction subreddit asks and answers numerous questions about electronic music production and provides threads filled with nuggets of knowledge gold you’ll appreciate as you grow as a producer. We Are The Music Makers is a similar subreddit to EDMProduction, but covers a wider territory as it is intended to discuss all genres rather than strictly EDM. That being said, it’s a useful resource to learn about production from a higher level that spans across all types of music making. Digital Music News focuses on the trending industry news happening right now, with a particular focus on the internal workings of the music industry – for example, music industry jobs, new distribution services and artist scandals. ASCAP is what is known in the industry as a PRO – an organization that helps artist collect royalties for their work. If you don’t have an account with them, their blog is still insanely useful, as it’s constantly updated with news around music industry laws and how they’re changing. BMI is an ASCAP competitor – another PRO in the industry. They’re similar to ASCAP with another killer blog on the same subject. Hypebot is an expert in the music tech world and discusses subjects like music streaming, music discovery and how to utilize your releases to make the most income. Bobby Owsinski’s a music production blog that sheds light on tips, tricks and gear recommendations for producers looking to expand their knowledge and add even more creativity to their work.